Helvine: Mineral information, data and localities. Helvine Group. Danalite-Helvine Series, and the Genthelvite-Helvine Series. The IMA officially recognized name (2012 IMA list) is helvine, not helvite, although the synonym "helvite" may be more common in the literature. Quartz 99 photos of Helvine associated with Quartz on mindat.org. Spessartine 47 photos of Helvine associated with Spessartine on mindat.org. Genthelvite 30 photos of Helvine associated with Genthelvite on mindat.org. Smoky Quartz 29 photos of Helvine associated with Smoky Quartz on mindat.org. Calcite 24 photos of Helvine associated with Calcite on mindat.org. Albite 23 photos of Helvine associated with Albite on mindat.org. Chlorite Group 18 photos of Helvine associated with Chlorite Group on mindat.org. Muscovite 16 photos of Helvine associated with Muscovite on mindat.org. Fluorite 12 photos of Helvine associated with Fluorite on mindat.org. Rhodochrosite 10 photos of Helvine associated with Rhodochrosite on mindat.org. Mohs, F. (1804) Des Herrn JAC. FRIED. VON DER NULL Mineralienkabinett, nach einem, durchaus auf äussere Kennzeichen gegründeten Systeme geordnet, beschrieben, und durch Hinzuthuung vieler, dem gegenwärtigen Zustande der Mineralogie angemessener, erläuternder Anmerkungen und nöthiger Berichtigungen, als Handbuch der Oryctognosie brauchbar gemacht. Wien. Vol. 1, p. 92-93. Freiesleben, J.C. (1817): Helvin.- Geognostische Arbeiten, Band 6. Freyberg, Craz & Gerlach, p. 126-129. Werner, A.G. (1817): Letztes Mineral-System.- Freyberg & Wien, p. 2 and 29. American Mineralogist (1985): 70: 186-192. The following Helvine specimens are currently listed for sale on minfind.com. 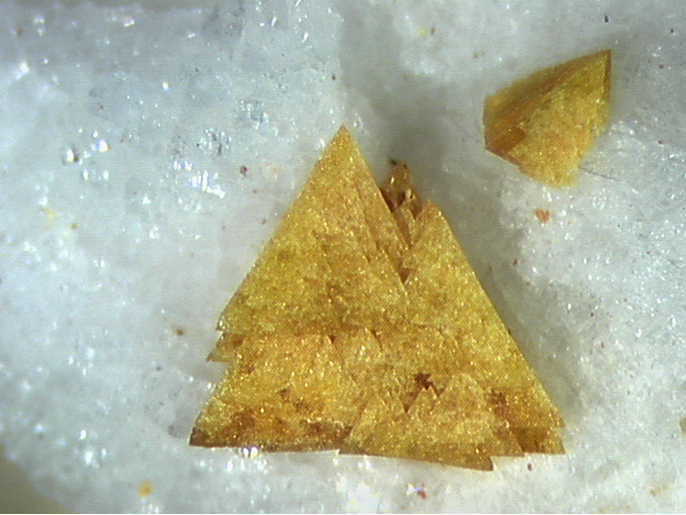 Rimann, E. (1928) Bodenbenderite, a new mineral from Argentina. Sitzungsber. Abhandl. Naturwiss. Gesell. Isis, Dresden. Festschrift fuer Richard Baldauf, 42-51. William T. Holser: Beryllium minerals in the Victorio Mountains, Luna County, New Mexico. AM 38, 519 ff. Zaw, K., Large, R. R., & Huston, D. L. (1997). Petrologic and geochemical significance of a Devonian replacement zone in the Cambrian Rosebery massive sulfide deposit, western Tasmania. The Canadian Mineralogist, 35(5), 1325-1349. Simpson, E.S. (1928) Famous Mineral Localities: Wodgina North West Australia, American Mineralogist, 13:9, 457-468. Calderwood, M.A., Grguric, B.A., Jacobson, M.I. (2007) Guidebook to the Pegmatites of Western Australia. Hesperian Press, Carlisle, Western Australia. Kolitsch, U. (2017): 2041) Helvin, Rutil und Spessartin vom Steinbruch Poschacher bei Artolz im Waldviertel, Niederösterreich. Pp. 261-262 in Walter, F. et al. (2017): Neue Mineralfunde aus Österreich LXVI. Carinthia II, 207./127., 217-284. KNOBLOCH, Gerald (2012): Erdgeschichte(n) zwischen Krems & Kamp.- 275 S., Pöllauberg (Living Edition). ; Kolitsch, U. (2018): 2090) Annit, Chamosit, Helvin und Ranciéit vom Tannenfeld (Tannfeld) bei Maigen im Waldviertel, Niederösterreich. P. 229 in Walter, F. et al. (2018): Neue Mineralfunde aus Österreich LXVII. Carinthia II, 208./128., 185-254. Orlandi, P., Campostrini, I. (2005): Zibaldone. Aggiornamenti di mineralogia Italiana 2004. Rivista Mineralogica Italiana, 3/2005, 184-191. A. C. Bastos Neto, V. P. Pereira, L. H. Ronchi, E. F. de Lima and J. C. Frantz (2009): The world-class Sn, Nb, Ta, F (Y, REE, Li) deposit and the massive cryolite associated with the albite-enriched facies of the Madeira A-type granite, Pitinga mining district, Amazonas State, Brazil. Canadian Mineralogist 47, 1329-1357. A.K. Chatterjee, "Copper-Zinc Deposit at McMillan Brook, Victoria County, Cape Breton Island", Nova Scotia Dept. Mines, Report 77-1, 1977. Huang et al. (1988): Hsianghualing rocks, mineral deposits and minerals. Beijing Sci. Techn. Publ. Bur. (Beijing), 255 pp. ⓘ Xianghuapu Mine (Maiwan Mine) ? Berthold Ottens (2009) Lapis, 34, #10, 31-41. Giuliani, G., Li, Y.D., and Sheng, T.F. (1988): Mineralium Deposita 23, 24-33. Raimbault, L., and Bilal, E. (1993): Canadian Mineralogist 31, 119-127. DU, S. and WEH, H. (2014), A New Type of Beryllium Resource from the Maka Tungsten Polymetallic Deposit, Laojunshan Ore Cluster, SE Yunnan Province, China. Acta Geologica Sinica, 88: 1447–1448. Novák, F., Jansa, J.: Parageneze nerostů s helvínem z chvaletického ložiska. Časopis pro mineralogii a geologii, 1965, roč. 10, č. 1, s. 75-79. Ragu, A. (1994): Helvite from the French Pyrénées as evidence for granite-related hydrothermal activity. Canadian Mineralogist 32, 111-120. Dubru. M, (1986) Pétrologie et géochimie du marbre à brucite et des borates associés au gisement de tungstène de Costabonne, (Pyrénées orientales, France) 930p Guitard, G. (2010): Catalogue raisonné de la collection de minéralogie régionale, C.E.R.P. de Tautavel, 28. J.C. Freiesleben (1817): Helvin.- Geognostische Arbeiten, Band 6. Freyberg, Craz & Gerlach, p. 126-129; Phillips, W. (1823): An Elementary Introduction to the Knowledge of Mineralogy, 3rd ed. William Phillips (London), 535 pp. Lahiri, D. (1972). Helvine in the gondite of Kajlidongri, Madhya Pradesh, India. Mineralogical Magazine, 38(300), 974-975. Campostrini, I., Demartin, F., Russo, M. (2014): Helvite e un probabile nuovo minerale del gruppo del pirocloro alla cava San Vito (Ercolano). GMT 2014 Giornate Mineralogiche di Tavagnasco, 6-8 giugno 2014. Plinius, 40, 149. 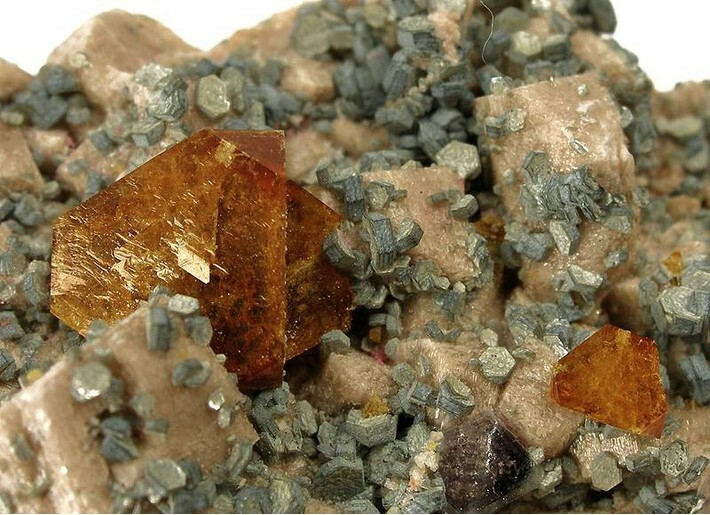 Della Ventura, G., Williams, C.T., Cabella, R., Oberti, R., Caprilli, E., Bellatreccia, F. (1999) Britholite-hellandite intergrowths and associated REE-minerals from the alkali-syenitic ejecta of the Vico volcanic complex (Latium, Italy): petrological implications bearing on REE mobility in volcanic systems. European Journal of Mineralogy, 11, 843-854; Oberti, R., Ottolini, L., Cámara, F., Della Ventura, G. (1999) Crystal structure of non-metamict Th-rich hellandite-(Ce) from Latium (Italy) and crystal chemistry of the hellandite-group minerals. American Mineralogist, 84, 913–921. Vanini F. (2000): Beura e Villadossola: nuovi ritrovamenti. Rivista Mineralogica Italiana, XXIV, 2, 123-124. F. Pezzotta (1994) - Helvite of a M.te Capanne pluton pegmatite (Elba island, Italy): chemical, X-ray diffraction data and description of the occurrence. - Atti Accad. Naz. Lincei, Rend., 9: 355-362. Endo, S. (2008) Chigaku Kenkyu, 57, 3-10. Matsubara, S., & Kato, A. (1980) Nagashimalite, Ba4 (V3+, Ti) 4 [(O, OH) 2| Cl| Si8B2O27], a new mineral from the Mogurazawa mine, Gumma prefecture, Japan. Mineralogical Journal, 10(3), 122-130. Yoshinaga, M. (1959) Mem. Fac. Sci., Kyushu University, Ser. D, 9, 47-53. STEPANOV, A.V., BEKENOVA, G.K., LEVIN, V.L., HAWTHORNE, F.C. & DOBROVOL’SKAYA, E.A. (2012): Tarbagataite,(K,□)2(Ca,Na)(Fe2+,Mn)7Ti2(Si4O12)2O2(OH)4(OH,F), a new astrophyllite-group mineral species from the Verkhnee Espe deposit, Akjailyautas Mountains, Kazakhstan: description and crystal structure Canadian Mineralogist 50,159-168. Guastoni A., Pezzotta F., Demartin F., 2003. Le pegmatiti di Zomba-Malosa (Malawi). Riv. Mineral. Ital., 27 (2): 66-77. ; Guastoni, A., & Pezzotta, F. (2007). 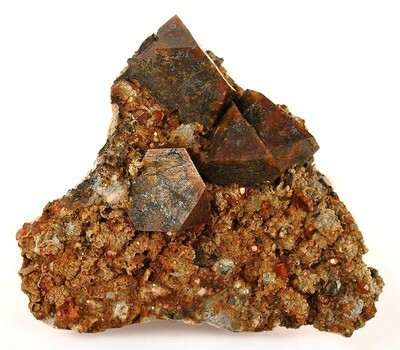 REE-mineral phases replacing helvite, niobian-rutile, bastnäsite-(Ce) from alkaline pegmatites of Mount Malosa, Zomba District, Malawi. Granitic Pegmatites: the State of the Art. Memorias, 8, 42-43. Dunn, P.J. (1991), Rare minerals of the Kombat Mine, Mineralogical Record: 22(6): 421-425. Oftedal, I. (1950): En litiumførende granittpegmatitt i Nordland. Norsk Geologisk Tidsskrift 28, 234-237. Personally collected by Peter Andresen in 2007. Mineralogical Record 28, no. 4 (1997); Hyrsl & Rosales (2003) Mineralogical Record, 34, 241-254.; Hyrsl & Rosales (2003) Mineralogical Record, 34, 241-254. Filimonova, L.G., and Chugaev, A.V. (2006): Geology of Ore Deposits 48(6), 489-498. Ivashchenko, V. I., & Lavrov, О. В. (2006) Ore Deposits and Occurrences in the North Ladoga Region, Southwest Karelia. in Ore Deposits And Occurrences In The North Ladoga Region, Southwest Karelia Field Trip Guidebook. Understanding the genesis of ore deposits to meet the demands of the 21st century 12th Quadrennial IAGOD Symposium 2006. Moscow. P.41-64. Garcia-Guinea, J., Correcher, V., Quejido, A., LaIglesia, A., & Can, N. (2005). The role of rare earth elements and Mn 2+ point defects on the luminescence of bavenite. Talanta, 65(1), 54-61. Garcia G., Gonzalez C., Bueno A. (2004) - Cadalso de los Vidrios (Madrid), Bocamina, n° 14, pp: 12-46. Stalder, H. A., Wagner, A., Graeser, S. and Stuker, P. (1998): "Mineralienlexikon der Schweiz", Wepf (Basel), p. 212. Kingsbury, A.W.G. (1961) Beryllium minerals in Cornwall and Devon: helvine, genthelvite and danalite. Mineralogical Magazine, 32, 921-940. Anthony, J.W., et al (1995), Mineralogy of Arizona, 3rd.ed. : 245; Warner, L.A., et al (1959), Occurrence of non-pegmatite beryllium in the US, USGS PP 318; Meeves, H.C. (1966), Nonpegmatite beryllium occurrences in AZ, CO, NM, UT and four adjacent states, US Bur. of ines Rept. Inv. 6828. Keith, Stanton B. (1973), Arizona Bureau of Geology & Mineral Technology, Geol. Sur. Branch Bull. 187, Index of Mining Properties in Cochise Co., AZ: 69 (Table 4); Anthony, J.W., et al (1995), Mineralogy of Arizona, 3rd.ed. : 245; Trischka, C., et al (1929), Diatomite in Arizona, Engr. Mining Jour. : 127: 13-14; Meeves, H.C. (1966), Nonpegmatite beryllium occurrences in AZ, CO, NM, UT and four adjacent states, US Bur. Mines Rept. Inv. 6828: 56..
Anthony, J.W., et al (1995), Mineralogy of Arizona, 3rd.ed. : 245. Jahns, Richard Henry & Lauren A. Wright (1951), Gem and lithium bearing pegmatites of the Pala district, San Diego County, California: California Division Mines Special Report 7-A: 31, 38. Jahns, Richard Henry & Lauren A. Wright (1951), Gem and lithium bearing pegmatites of the Pala district, San Diego County, California: California Division Mines Special Report 7-A: 31, 38; Murdoch, Joseph & Robert W. Webb (1966), Minerals of California, Centennial Volume (1866-1966): California Division Mines & Geology Bulletin 189: 215; Pemberton, H. Earl (1983), Minerals of California; Van Nostrand Reinholt Press: 368. Murdoch, Joseph (1946), Progress on revision of Bulletin 113 “Minerals of California,” with notes on some new mineral occurrences: California Division Mines Report 42: 198; Murdoch, Joseph & Robert W. Webb (1966), Minerals of California, Centennial Volume (1866-1966): California Division Mines & Geology Bulletin 189: 215; Pemberton, H. Earl (1983), Minerals of California; Van Nostrand Reinholt Press: 368.; Jesse Fisher (2011) Mines and Minerals of the Southern California Pegmatite Province. Rocks & Minerals 86:14-34. Meeves, H., et al (1966), Reconnaissance of beryllium-bearing pegmatite deposits in six western states, US Bur. Mines Info. Circ. 8298: 26 (Table A-1). Rocks & Min. : 63: 366-384. Henderson, William A., Jr., Charles Weber and Marcelle Weber. (circa 1970), An Alpine Vein Deposit in Stratford, Conn. unpublished manuscript. ; Henderson, William A., Jr., Charles Weber and Marcelle Weber. (circa 1970), Helvite from Stratford, Conn. unpublished manuscript. Rocks & Min. : 16: 244.; U.S. Geological Survey, 2005, Mineral Resources Data System: U.S. Geological Survey, Reston, Virginia. Rocks & Min. : 16: 244, 247. Art Smith (2001) Mineral News, 17, #3, 1-7. Minerals of New Mexico 3rd ed. ; Weissenborn, A.E. (1948): A new occurrence of helvite. Am. Mineral. 33, 648-649. [http://www.minsocam.org/ammin/AM33/AM33_648.pdf]; Peter Dunn (1976) Genthelvite and the helvine group. Mineralogical Magazine, 40, 627-636. In the collection of Brent Thorne. Acquired from Jason Smith. Rocks & Min. : 60: 165.; Am Min 53:2110; Pegau, A. A. (1932). Pegmatite deposits of Virginia. Virginia Geological Survey Bulletin No. 33.; Lumpkin, G. R. (1998). Rare-element mineralogy and internal evolution of the Rutherford# 2 Pegmatite, Amelia County, Virginia; a classic locality revisited. The Canadian Mineralogist, 36(2), 339-353.